Graduate students and alumni from UNC’s Gillings School of Global Public Health are adding their names to the long list of those supporting Maya Little, the UNC graduate student arrested in April for defacing the Confederate monument known as “Silent Sam” on the flagship campus at Chapel Hill. In a statement the group of public health students and alumni calls out UNC Chancellor Carol Folt for not backing the effort to remove the statue, which is the only Confederate monument on a UNC campus. Meanwhile, in the current legislative session, several Democratic state lawmakers have filed a bill to relocate Silent Sam. House Bill 1030/Senate Bill 764 was filed last week. The bill proclaims that due to the “recent acts of vandalism” the statue needs to be moved to a permanent indoor location somewhere on campus. 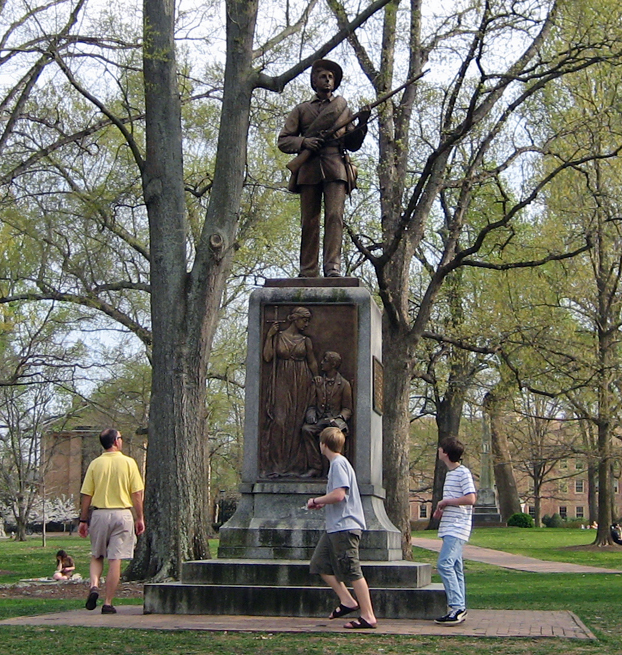 It’s a compromise solution some in the movement to remove the statue from campus entirely say does not go far enough – but others argue it would keep students and faculty from having to encounter the statue every day. Rep. Graig Meyer (D-Orange), one of the bill’s primary sponsors, took to Twitter over the weekend to argue for the relocation. Leaders of the GOP majority in the General Assembly and members of the Republican dominated UNC Board of Governors have opposed moving the statue, arguing instead for more security and more harsh punishment for those involved in protests that might damage it.